The PenTest magnetic pull-off coating thickness gauge operates according to the magnetic attraction principle for non-destructive, quick and easy measurement on coatings such as paint, plastics, enamel on steel. 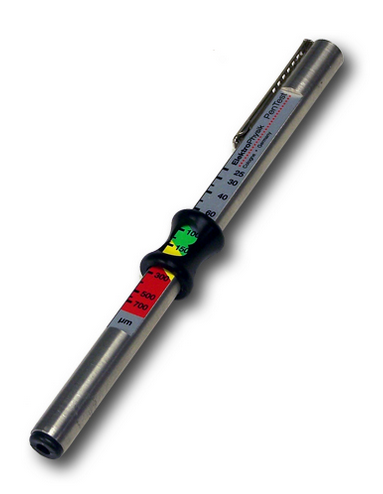 Featuring a patented HOLD mechanism, the PenTest gauge keeps the thickness indicator in place for easy reading. The HOLD mechanism can be used as a “memory” for the last reading. Applications include quick-check measurements on steel constructions, painted steel panels and all kinds of steel substrates. 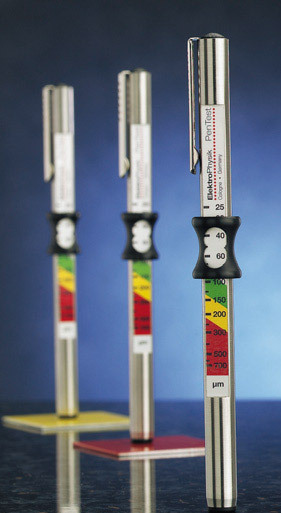 Measuring principle according to DIN EN ISO 2178. No batteries or other power supply required. Minimum measuring area 25 mm / 1in dia. Dimensions 151 mm / 6in length, 10 mm dia.